The dates for the Our Telekom National Beach Soccer Championship are from July 25 – 30. The venue is DC Park which is situated on Guadalcanal and owned by the major sponsor of the national beach soccer team, DJ Graphics Ltd. 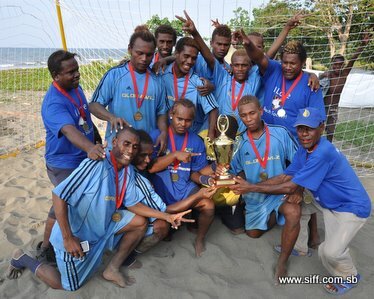 The Solomon Islands Football Federation (SIFF) competitions department revealed this afternoon that the preparations for the national beach soccer championship are already underway. So far 6 provincial football associations have indicated their interest to participate but full confirmations are expected at the end of the week. This will be the second year for the Our Telekom National Beach Soccer Championship to be held. The inaugural edition was held last year at the same venue and featured 10 teams from 8 of the 10 provincial football associations of SIFF. This year SIFF is hoping to see a similar number of teams attend the beach soccer championship. Western Province in particular is preparing a province based side which has been training for over a month already. They are training under the leadership of former national player, Benjamin Mela, and current national goalkeeper, Izomo Bird. “A number of current and former national players are in Gizo and they are supervising the preparations of the squad that is training here. They have reported to me that they training is progressing well and they look forward to fielding a good team at the championship,” Western Football Association (WFA) general secretary, Robert Riqeo says. Malaita is also known to be preparing a team from the northern region of the province for the national championship. Last year, a representative side from Malaita surprised everybody by finishing second behind Honiara. The SIFF competitions department is calling on provincial football associations to check and confirm their attendance by the end of this week and to ensure that all team lists are returned by the deadline specified on the forms. A spokesperson from the SIFF media and competitions department, Joseph Boso, says that all necessary participation forms have been issued to the provincial football associations and the office is looking forward to receiving them back this week. “We issued confirmation of participation forms to provincial football associations in May and a number have already returned them indicating that they will participate. At least one province has opted not to participate and there are 3 others which we are yet to hear from,” Boso says. The deadline for final confirmations is Friday 15th July, 2011. All team lists are expected to be at the SIFF office by 5:00pm Wednesday 20th July, 2011.